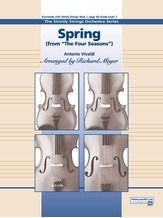 This well-crafted arrangement, very faithful to the original, is sure to be enjoyed by orchestras of all levels. Notes and rhythms are well within the reach of younger orchestras, while more advanced groups will be challenged by the stylistic demands. Contains solo passages for violin and cello.